Well, we did it! 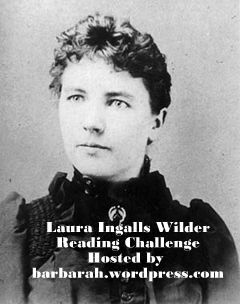 A few days late and a few dollars short but we got our Wilder book in this year, thanks to Barbara's Laura Ingalls Wilder Reading Challenge which she hosts every, um, February. I was originally going to read the kids The Long Winter but, as it turns out, we experienced quite a mild winter ourselves. I didn't feel that that book would be as impacting when we're wearing short sleeved shirts. 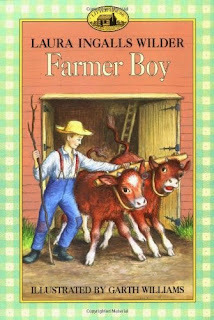 Instead, I opted to read Farmer Boy which I can't say as ever been my favorite of the Little House books but, as seems to nearly always be the case, it improved for me upon a re-read. I'll refrain from sharing the storyline for Farmer Boy because I'm sure that most people already know it (or can easily look it up) but I will note that Farmer Boy tells the story of Almanzo Wilder's (Laura's husband's) childhood. It's interesting to think of him relating to Laura stories from his past. I'm sure some of the facts must be a bit hazy because he could only tell her things from his perspective but, whatever the case, it makes for a jolly read. Warning: this book will also make you hungry as much of the story focuses on what you'd find on the Wilder dinner table. (Wouldn't I like to be a guest there! With a hearty metabolism to boot!) My boys were enthralled with the food which runs rampant throughout the story. Not a few pages would go by before there was a howl of desire rising from all of the children's throats as we read about Almanzo eating slice after slice (after slice) of pie, glorious pie! Can we label the food as its own unique character in this book? It features so prevalently that I have to wonder. Did you like the book? Yes. Why? Because there was lots of yummy food! If you could eat anything you wanted to at one meal, what would you eat? Pancakes and chocolate ice cream, mandu, apple pie and a raspberry pie. What was your favorite part of the book? When Almanzo got the $200. What would you do if someone gave you $200? I would say, "YAY!" Would you ever want to read this book again? No. Why not? Because then I would have to listen to you read about all the yummy food again. Would you tell other people to read this book? Yes. Did you like the book Farmer Boy? Yes. Why? Because he got to eat all of that candy. What was your favorite part of the book? When the log fell on Almanzo. Why was that your favorite part? Because I thought it was exciting. Why was that part exciting? Because it was a little bit scary. What food from the book would you want to eat? All of the yummy sugar stuff. And pancakes for breakfast. Would you ever want to read this book again? Yes. Would you tell other people to read this book? Yes! Did you like the book Farmer Boy? Mmm-Hmm. What was your favorite part? Christmas and all the yummy food. Maybe next year we'll see some snow and that'll make The Long Winter a more appropriate read. Either that or we'll blast the air conditioning. Thanks, Barbara, for hosting this challenge yet again (and for accepting even us late comers)! I surely do appreciate it. Also, Bookworm2's exciting-scary. It's amazing how scary can be exciting. Interesting that your kids weren't bothered by the teacher who was beaten to death by the big boys. I've avoided this book with the twins after reading it with DS1. I've felt the same way with this book - that it wasn't one of my favorites, but when I read it again I do enjoy it. I've always marveled at how much work the kids were expected to do, and seemed to do without fussing about it. In one of the books I read this year, Almanzo said he had been doing a man's work since he was 9. I guess that's one reason he built up such a big appetite. Glad your Bookworms enjoyed it! The Long Winter is my least favorite. I don't think I've read it again in recent years. It's just so bleak and it feels like it goes on forever. Now that was a totally enjoyable book review! And now I want some pie!